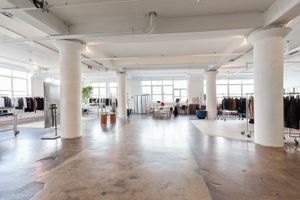 This bright and spacious showroom in the bustling area of SoHo is perfect for Ready-To-Wear Showrooms, Fashion Week Events and Sales as well as Private Events. This vast showroom has interiors in a style classic to Lower Manhattan with exposed stone walls, gray concrete flooring and large windows with metal frames. The space is open plan with large pillars that break up the space, and large windows create a bright atmosphere in flooding the room with natural light. This loft space is flexible in terms of set-up and can accommodate a range of showroom events. 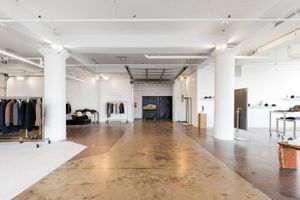 Located between the Canal St and Spring St Subway stations, this showroom is easily accessed and it surrounded by creative retailers and art galleries. 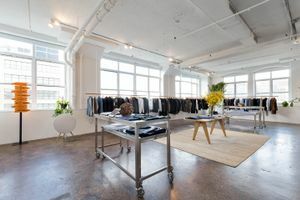 It's a great space for emerging to high-end brands to host their unique pop-up event.